It is good for us to know that Jesus sees our labor and effort. He perceives all that concerns us, and he knows the issues that matter most. Attentive and keenly aware he comes. It is quite common for us to think that he isn’t aware, and we may feel that he will pass us by without a word. But that is not the case at all. Jesus watches us, all the time. He knows the battle, the fight we have with our flesh, and the difficulty we have with the challenging people in our lives. Not everyone loves me, and I struggle a large part of the time. My depression, and my paranoid fears cannot obscure his sight. Jesus knows when (and why) I labor like I do. And he doesn’t condemn me at all. 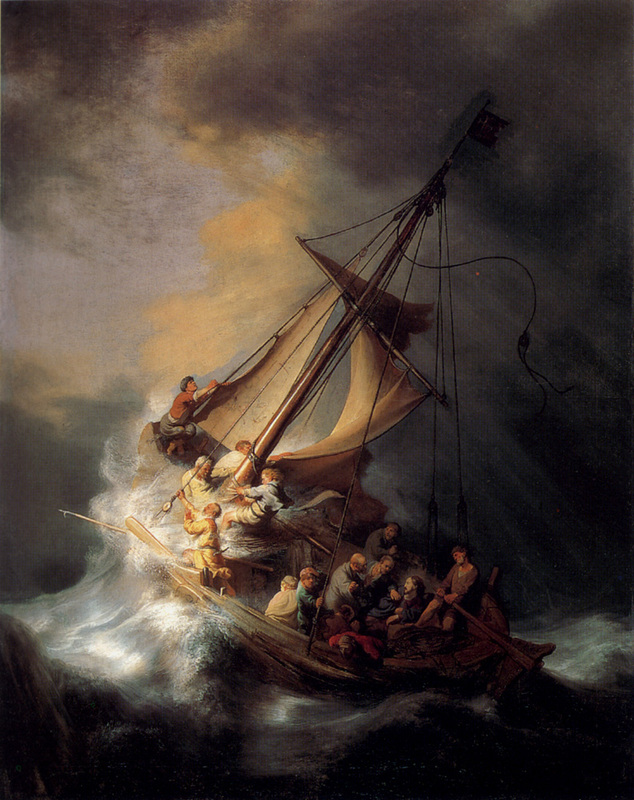 The disciples were straining very hard to move the boat. Every oar was being used and every man had his seat. They probably tried to work together. Considerable effort was being expended, but to no avail. The wind pushed harder against them. This is perplexing. If you remember, they are trying to obey the command of Jesus to cross the sea. Why do things have to be so difficult? I’m intrigued by believers who expect sunshine, blue sky and red roses because they are doing God’s Will. They don’t seem to factor in the issue of conflict and challenge. They see their “Goliath” and they pretend that he doesn’t exist, or they try to make peace with him. The battle to come is of no consequence and doesn’t happen. We are sorely mistaken. Doing the will of God will often mean that there will be a headwind directly at us. The seas will become impossible, and we may even be driven back. But special comfort comes, when we realize we are being watched. Jesus is doing constant surveillance on us, and he even sees our toil on the oars. What a precious promise. As I suffer with manic depression I have come to see that much grief comes not from mania, and not from the debilitating depression. These are both substantial, but my biggest issue has to do with the inertia that lies between these two poles. There is a paralysis– an apathy that immobilizes me. And this is as bad as any other state of mind. My passivity is disturbing, and bipolar disorder is as much of “detachment” as it is of extremes. I sit and stare, not able to motivate myself to get up and do something. I’m not really depressed, but nor am I manic– I’m just “there” unable to find energy to do anything. Life just rolls over me. Inertia is not just a part of a mental illness. It effects normal people as well, and there are degrees of it. The average person it seems will avoid making a real decisive decision at all costs. Inertia can be encountered in any church (ask a pastor who tries to get volunteers) or workplace. In his day, Elijah cried out for a decision from the Israelite people. I have to believe he was disturbed not only by the idolatry– but by the passiveness of the bystanders. Their neutrality was a big issue. I know my own heart, and I know my own spiritual paralysis. Rather than commit myself, I would rather settle down on a sofa and just let things happen. I’m quick to point out how those in the arena are doing it all wrong. I’m ready to criticize, but unwilling to volunteer. Mental illness is filled with ordinary things, but often in the wrong proportions. When we do things it is extreme or not at all. My own apathy is just a mirror of what happens in the hearts of normal people. I may be excessive, but my own issues have made me aware of what is happening in others.